We slept until 9:30 and ate breakfast in the hotel dining room. There were a lot of late eaters there. The desk clerk gave us a metro map. 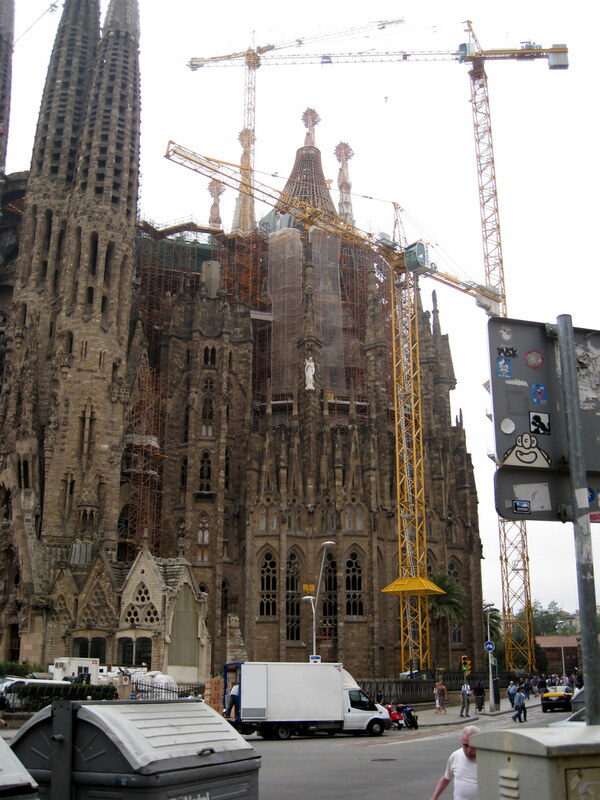 We had to walk several blocks up via Laietana to the Jaume I metro stop for our trip to Sagrada Familia. We checked out the map, bought our tickets and found the right train. We had to change trains, but did alright. Across from our exit stop at Sagrada Familia was a KFC so we went in to use their bathroom. 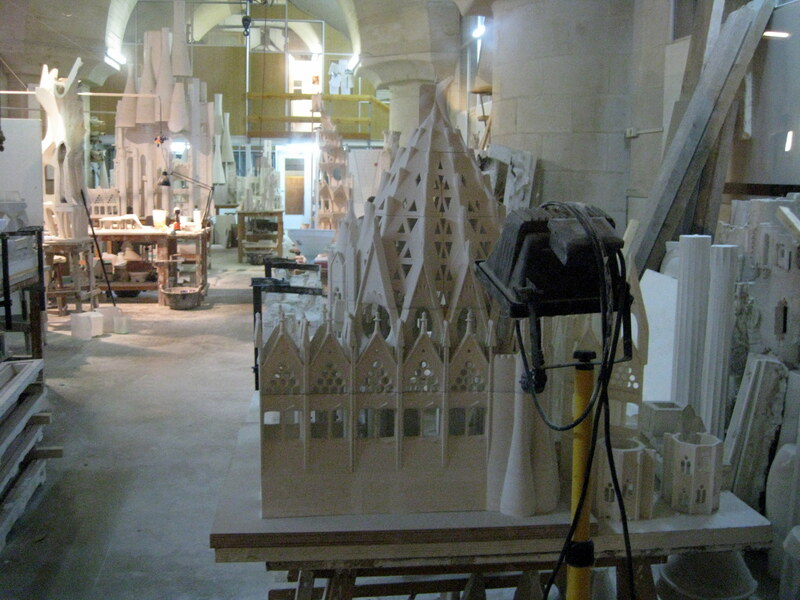 For a history and description of Sagrada Familia see Day 7. We were on the south side of the church so we walk around to the north side, the Passion Side, to get our tickets to go in. There wasn’t a very long line. It was amazing to see the more modern carvings of the Passion side close up. 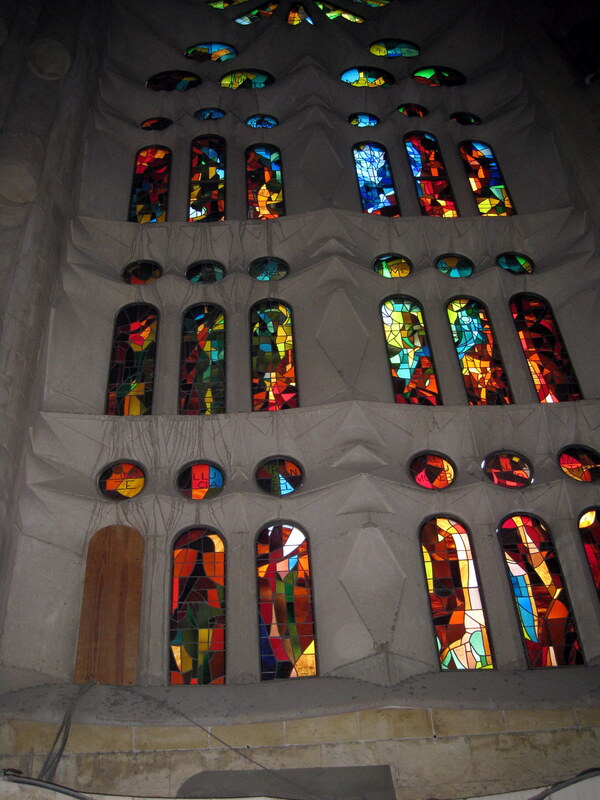 We went inside and took some pictures of a beautiful modern stained glass window. There was a long line to go up in the tower, but we decided against it. I think the elevator took passengers up, but you had to walk back down. The inside was unbelievable. Of course they are still working on it. The ceiling and roof are complete. 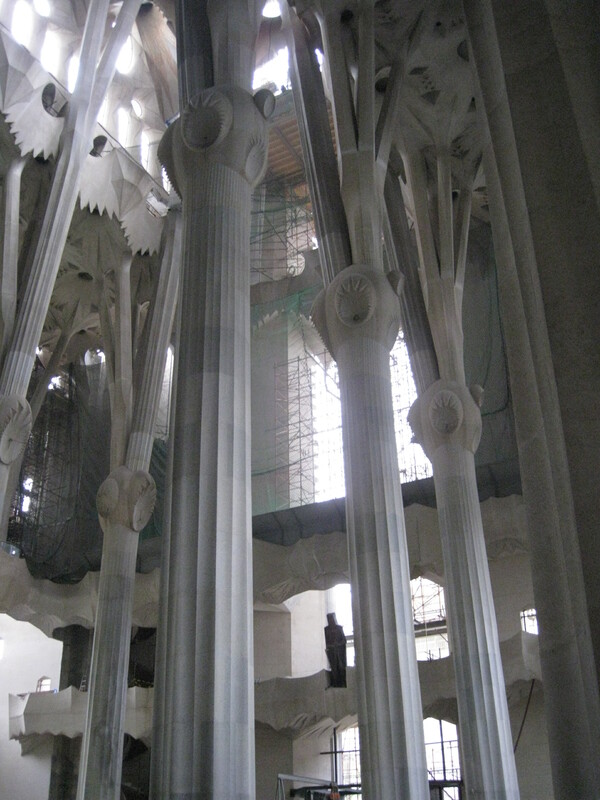 All of the major columns which look like trees are finished. The entire center is marked off due to the construction. Inside workers are working on molds and shapes. It was interest to watch the actual building that was taking place. 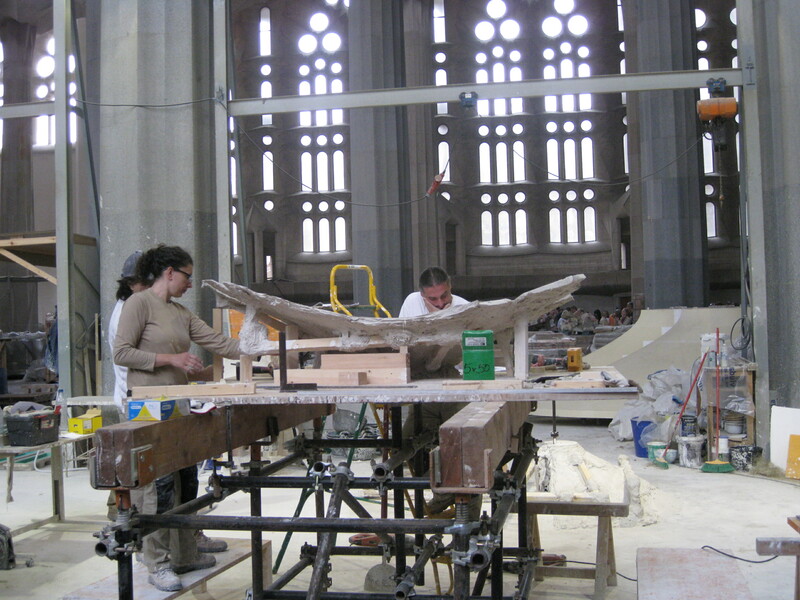 There was a lot of scaffolding in the apse area. We spent a lot of time walking around and looking. It is supposed to be about twenty more years until it is completed. Part of the west front is finished and there are interesting doors. The crypt was closed except for services. We went outside and then down in the museum. There were a lot of large models and drawings. Next we went into the gift shop and bought a few souvenirs. 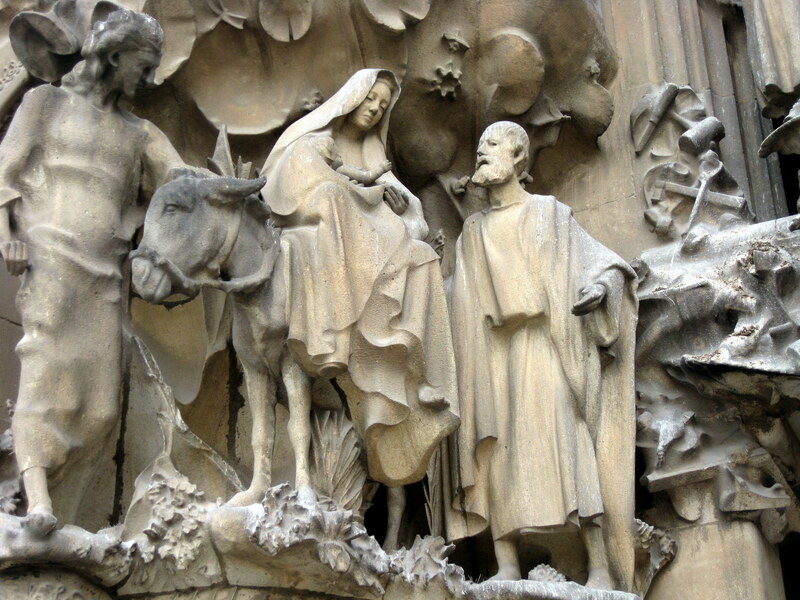 I took a lot of close up pictures of the Nativity side. We were there for over two hours. We then took the metro back to Juame I, changing trains along the way. We stopped at a tapas bar near the metro for lunch. We had focaccia and an iced coffee milk shake. We walked back to the hotel for a nap. Later we back out toward the beach. 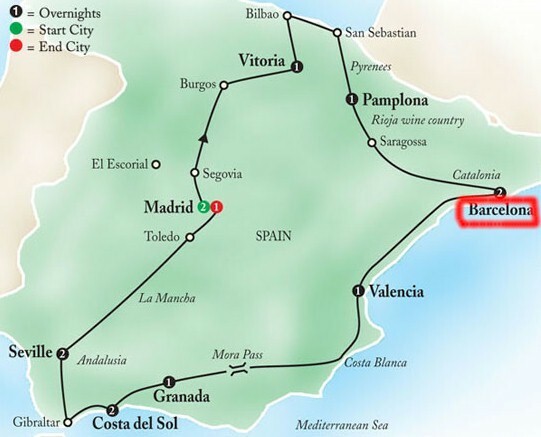 This area is called Barceloneta. It is a neighborhood which was constructed during the 18th century for the residents of the Ribera neighborhood who had been displaced by the constructions of the Citadel Park. 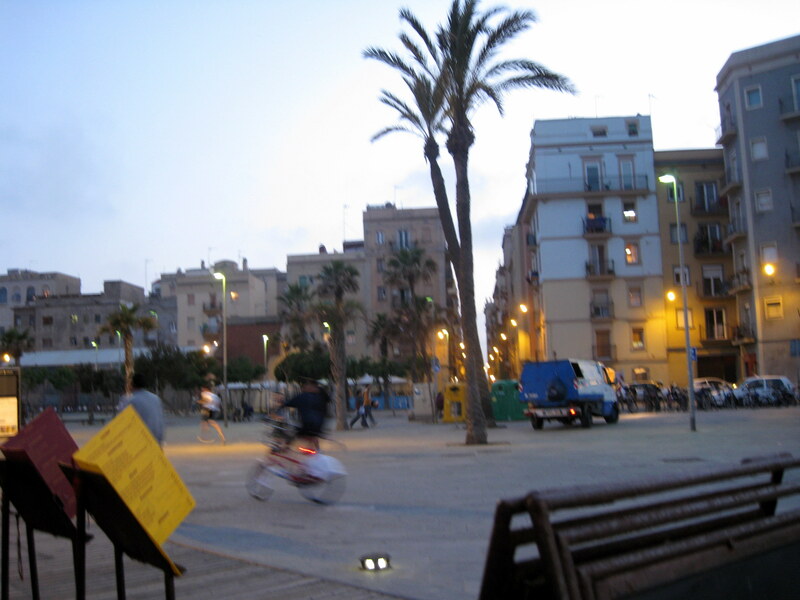 Barceloneta beach is considered the third best beach in the world. It has many restaurants and nightclubs along the boardwalk. The beach runs into the Port Olimpic and Frank Gehry's sculpture. We had dinner at Can Costa. We ate outside under a large awning. We had a wonderful meal. My wife had lobster and rice and I had cod in orange sauce. There wasn’t anyone else there, sort of strange. One of the things that we had a hard time adjusting to was that most Spaniards don’t eat dinner until 10:00 pm. We never could wait that long. After dinner we walked further along beach and stopped at a beach bar, and had a Bailey’s Irish Cream. We walked back to the hotel and enjoyed a gelato on the way.